Welcome to Preferred Printing Services Inc.
Place an order with Preferred Printing Services and enjoy the positive impact of a high quality paper laser cheques with basic or premium watermark security features. Specializing in business laser checks for all varieties of software including Simply Accounting, AccPac, M.Y.O.B., QuickBooks, Canpay, DacEasy, New Views, Vigiliant, as well as any custom software you may use. 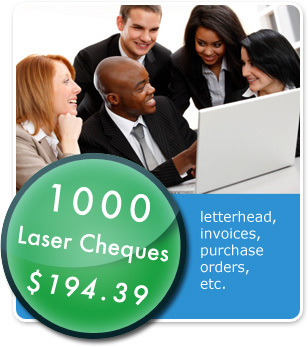 Company laser cheques can be customized with your company logo free of charge. Preferred Printing Services also prints envelopes, letterhead, invoices, purchase orders and more at very competitive prices with a very experienced and knowledgeable staff which offers personalized and prompt service, from small jobs to large we manufacture the product 100%. This enables us to meet and exceed scheduled delivery dates.